meiko can look back on four interesting days at the trade fair in Amsterdam. 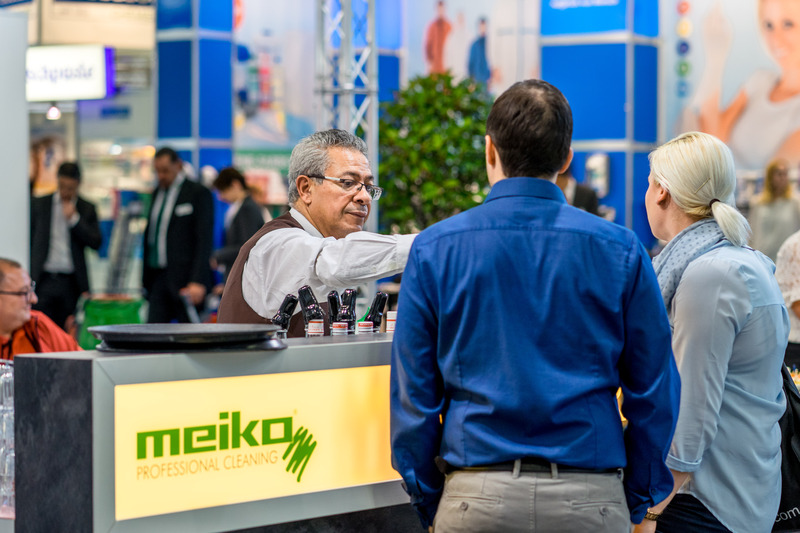 With its sophisticated cleaning solutions, meiko was a success at this year’s INTERCLEAN 2018. In particular, the 4T HighSelect car range and the Micro BRUSH Pad aroused great interest among the visitors. For impressive cleaning results on stone floors, safety flooring and PVC – the Micro BRUSH Pad is a powerful, cost-effective solution for sustainable basic, interval and maintenance cleaning. This is because the pad maintains its high cleaning performance over large surface areas, needs little in the way of chemical cleaning agents and is considerably more durable when compared with other pads. meiko’s new 4T HighSelect car trolley range combines modern design and technical innovation. It is manufactured from plastic reinforced with fibreglass and is particularly break-resistant and durable. The vertical press is designed in such a way that the entire operation procedure saves energy and puts less strain on the back. The 4T HighSelect car is available in four versions with a handle or pushing bar as well as with a utility tray and rubbish bag holder. Cool cocktails, exciting, innovative products and effective advice – a successful combination that was well received by our visitors this year, too. Naturally, Nouri Karoud – one of Berlin’s best barkeepers – created delicious, alcohol-free drinks right at meiko’s exhibition stand. Once again, INTERCLEAN 2018 was an excellent opportunity to intensify and develop our international contacts.